292 South La Cienega Blvd. PLEASE NOTE: Our office is located just north of Gregory Way. If you use a GPS, make sure to enter ‘Beverly Hills' as the city and ‘90211' as the zip code, or you will end up at an address about 3 miles north of us. 2 hours free public parking directly southwest of our building. This City of Beverly Hills parking lot is located on the west side of La Cienega Blvd. – just south of Gregory Way – at 325 S. La Cienega Blvd., Beverly Hills, CA 90211. It can only be entered while traveling south on La Cienega. First two hours are free and 75 cents per half-hour after that. 3 hour street parking on Gregory Way for 25 cents per hour – Mon-Sat, 8-6 PM. Underground parking at our own building is available Mon-Fri, 8 AM-6 PM. The rate is $1.50 for each 15 min with a $12 daily max. No grace period and no in/out. After 4 PM there is a $7 flat rate. Lost ticket pays daily max. No valet or validation. IMPORTANT: There is NO parking on La Cienega Blvd. from 7-9 AM and 4-6 PM. Please DO NOT park there during this time as your car WILL GET towed. Please arrive 15 min prior to your scheduled appointment to give yourself enough time to fill out our intake form. The information provided will be of great benefit to you as it gives us the opportunity to tailor each session according to your own personal needs. 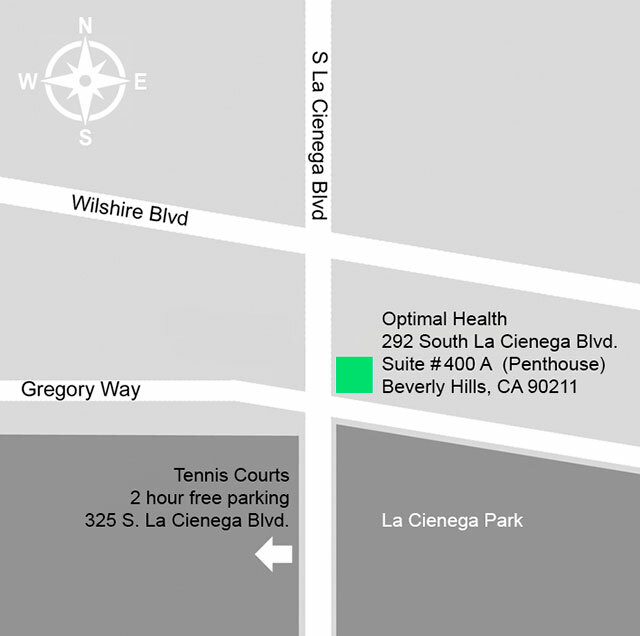 Address: 292 S. La Cienega Blvd.